Dollar General Announces to Build New Distribution Center and Create Approximately 400 New Jobs in Longview, Texas | LEDCO | Longview Texas Economic Development Corp.
GOODLETTSVILLE, Tenn.--(BUSINESS WIRE)--Dollar General Corporation (NYSE: DG) announced plans to build a new distribution center in Longview, Texas this morning. The state-of-the-art facility in Gregg County is expected to create approximately 400 new jobs at full capacity and serve approximately 1,000 Dollar General retail locations in Texas and the southeast. Construction should begin in early 2018 pending the receipt of all required governmental permits and development approvals and the absence of unforeseen circumstances. Dollar General plans to make the Longview distribution center its 17th facility in the major discount retailer’s distribution network and second in Texas. In 2014, Dollar General announced plans to build its first Texas distribution center in San Antonio, Texas. Located in Bexar County, that facility celebrated its grand opening in 2016. 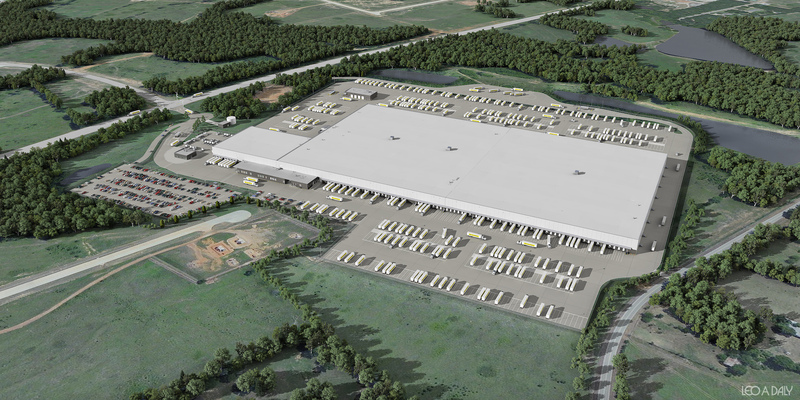 In addition to the full-time jobs the facility is expected to create, Dollar General also anticipates a strong economic impact through hundreds of jobs needed to construct the nearly 1,000,000 square foot building. Dollar General has selected Clayco as the project’s official general contractor, Leo A. Daly as the architectural engineering firm and Elan Design as the civil engineering firm. Dollar General takes a number of factors into consideration when choosing distribution centers including its location, its proximity to Dollar General stores, its local business environment and workforce and the availability of local and state economic incentives, among many others. Dollar General currently has more than 1,400 stores and over 12,000 employees in Texas. Dollar General currently has 15 distribution centers that are located in Alabama, California, Florida, Georgia, Indiana, Kentucky, Mississippi, Missouri, Ohio, Oklahoma, Pennsylvania, South Carolina, Texas (San Antonio), Virginia and Wisconsin. The Company’s 16th distribution center in Amsterdam, New York is currently under construction. This press release contains forward-looking information, including statements regarding Dollar General’s outlook, plans and intentions including, but not limited to, statements made within the quotations of Messrs. Vasos and Mansfield. A reader can identify forward-looking statements because they are not limited to historical fact or they use words such as “may,” “will,” “believe,” “plan,” “expect,” “estimate,” “forecast,” “anticipate,” “intend,” “should,” “could,” “would,” or “look forward,” and similar expressions that concern Dollar General’s strategy, plans, intentions or beliefs about future occurrences or results, including without limitation statements regarding job creation, economic impact, and timing related to the Longview, Texas distribution center. All forward-looking statements are qualified in their entirety by these and other cautionary statements that Dollar General makes from time to time in its SEC filings and public communications. Dollar General cannot assure the reader that it will realize the results or developments Dollar General anticipates or, even if substantially realized, that they will result in the consequences or affect Dollar General or its operations in the way Dollar General expects. Forward-looking statements speak only as of the date made. Dollar General undertakes no obligation, and specifically disclaims any duty, to update or revise any forward-looking statements to reflect events or circumstances arising after the date on which they were made, except as otherwise required by law. As a result of these risks and uncertainties, readers are cautioned not to place undue reliance on any forward-looking statements included herein or that may be made elsewhere from time to time by, or on behalf of, Dollar General. Dollar General Corporation has been delivering value to shoppers for over 75 years. Dollar General helps shoppers Save time. Save money. Every day!® by offering products that are frequently used and replenished, such as food, snacks, health and beauty aids, cleaning supplies, basic apparel, housewares and seasonal items at everyday low prices in convenient neighborhood locations. Dollar General operated 14,321 stores in 44 states as of November 3, 2017. In addition to high quality private brands, Dollar General sells products from America’s most-trusted manufacturers such as Clorox, Energizer, Procter & Gamble, Hanes, Coca-Cola, Mars, Unilever, Nestle, Kimberly-Clark, Kellogg’s, General Mills, and PepsiCo. For more information on Dollar General, please visit www.dollargeneral.com.